Does New Alabama Law Protect Children At School Bus Stops? School Bus Safety. Each morning buses throughout Alabama carry our children safely to school. Every afternoon those same buses deliver our children safely home. School bus travel is relatively safe. 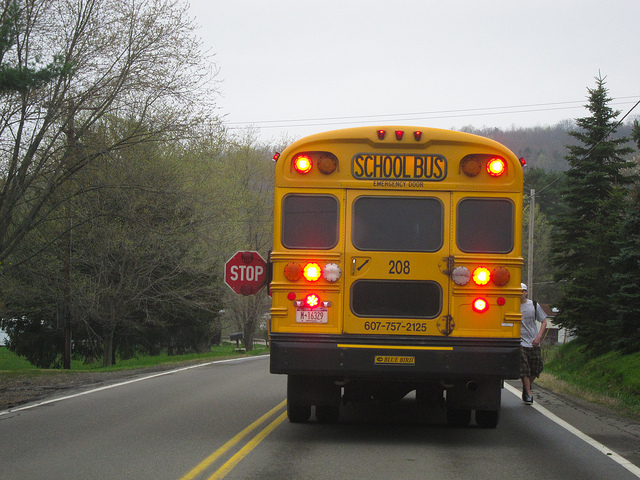 Most often, it’s not the school bus or its driver that creates the danger of injury. Instead, it’s the automobile drivers around the bus who neglect safety and create risks of injury. The North Carolina article continues by reporting that 13 children were killed at school bus stops in that state between 1999 and 2015. Many more children likely suffered personal injuries from dangerous drivers attempting to pass stopped buses. By one estimate, American drivers illegally passed school buses more than 13 million times last year. According to the article, at least 15 states allow cameras on school buses to capture drivers illegally passing. However, simply photographing cars is not enough. We need to punish drivers who choose to risk the lives of our children by speeding around a stopped school bus. This summer, the Alabama Legislature passed a new law allowing cameras on school buses. The law allows school systems to photograph drivers who refuse to wait for stopped buses and to fine those drivers. Alabama school districts now have the option to add cameras to buses under the Alabama School Bus Safety Act. The law went into effect July 1. The cameras would be set up similar to a red light camera and a ticket would be mailed to the owner of the vehicle. The fine for passing a stopped bus is $300. Eighty percent of the money would be split between the school board and the city or county of the school. The remaining funds would be divided between the State Department of Education and the Alabama Law Enforcement Agency. Local authorities would assist with the new law. Cameras on school buses that can catch drivers endangering our school age children – that’s a positive development which may prevent needless injury. But, just a $300 fine for a violation that puts kids lives at risk – that’s far too little penalty. Our law firm is committed to reducing automobile accidents on our roads and highways. If the Alabama Legislature is really serious about reducing reckless behaviors endangering our children, it will provide serious penalties to deter those bad behaviors.